4/12/12 Etruscan Phrases showing Etruscan conjugation and declension patterns and vocabulary. Translation of the Tavola Eugubine Script N.
Translation of the Tavola Eugubine Script "N"
The words are selected from the Etruscan_Phrases_a.html, Grammar and GlossaryA. This script is highly repetitive with epithets and phrases juxtaposed as in a magical incantation. 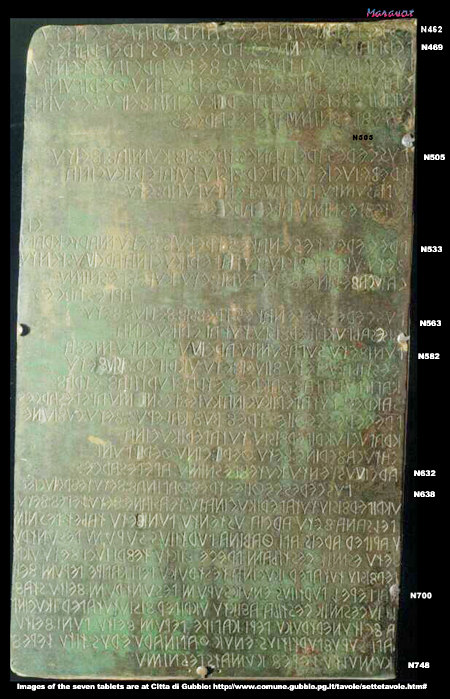 The text is being updated based upon better images of the Tavola Eugubine tablets. N582 I placed to forbid he is lulled to sleep; I am of you; I keep at a distance; to reveal; woe is me! N582 PVNI 8ETV SVPA: SVM TV: ARCIV: VSTENTV: ME 8A: [Translation: I placed (L. pono, ponere, posui [posivi], positum [postum]) to forbid (L. veto [voto] votare, vetitum) he is lulled to sleep (L. sopio-ire); I am (L. sum) you; I keep at a distance (L. arceo-ere-ui) to reveal (L. ostendo-tendere-tendi-tentum and tensum); woe is me! (L. vae!)] Note: ME8A declines: ME8A, ME8E, and it may be "he/she mistrusts" (Fr. méfier). Return me to the Aph.html. Copyright © 1981-2012 Maravot. All rights reserved. Copyright © 1981-2012 Mel Copeland. All rights reserved. Use of the information on this page for publication in any media is expressly forbidden without the prior written consent of the author.